Chapter 3. Language Policies in the U.S.A.
Chapter 6. English Only or English Plus? Designed to stimulate student projects and independent study, the Online Resource Guide features both primary source materials and current articles about the theory and practice of bilingual education. The latest version includes legislation, court decisions, Congressional hearings, Census publications, historical documents, ERIC digests, and NCELA reports, along with Internet links to key research studies, online journals, resource centers, state and federal agencies, professional organizations, and a wealth of related information. "A fascinating glimpse into this complex policy issue [by] one of the most seasoned and astute observers of the politics of bilingual education. ... I plan to keep a copy to lend to anyone I run across who is possessed by the many myths about bilingualism and language policy in the U.S."
"Interesting, informative, and exceedingly well-written. ... A valuable resource for practitioners, policymakers, and others." "An excellent review of recent research and theory." "Incisive ... superbly written and exquisitely organized. ... The 'fraud or libel' proceedings which U.S. English threatened ... indicate that this book pulls no punches. ... Should be sent to every legislator and schoolboard member in the U.S.A."
"A noteworthy addition to the literature." "The best documented, most complete, and most useful book on the issues facing bilingual eduators today. 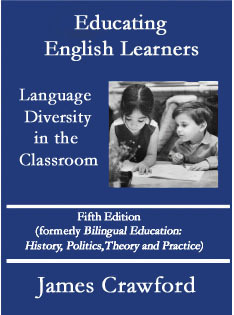 ... A 'must' for reading lists and for the training of bilingual teachers."